The King William Fair is an event held every year in the historic King William District near downtown San Antonio. 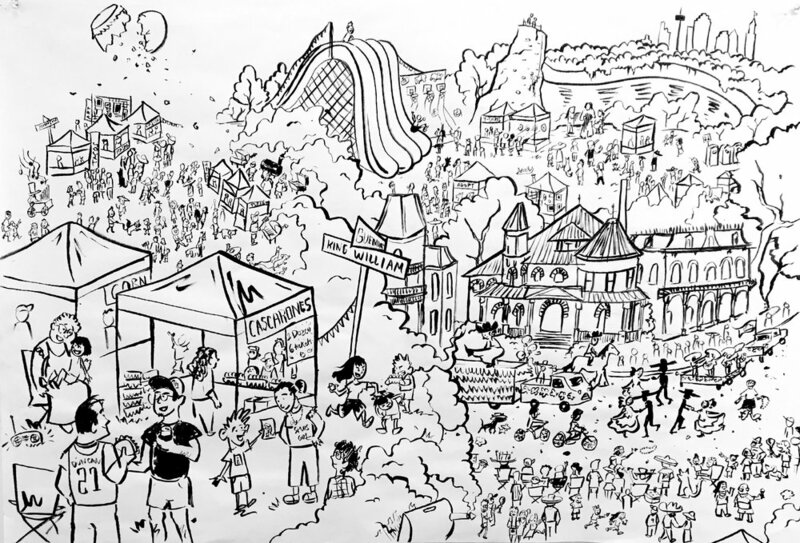 I aimed to capture the atmosphere and energy of the fair as I experienced it in my childhood. I used a variety of strategies, including cheerful, saturated hues often associated with papel picado, or cut paper art, to evoke the Mexican heritage that is celebrated at the event. 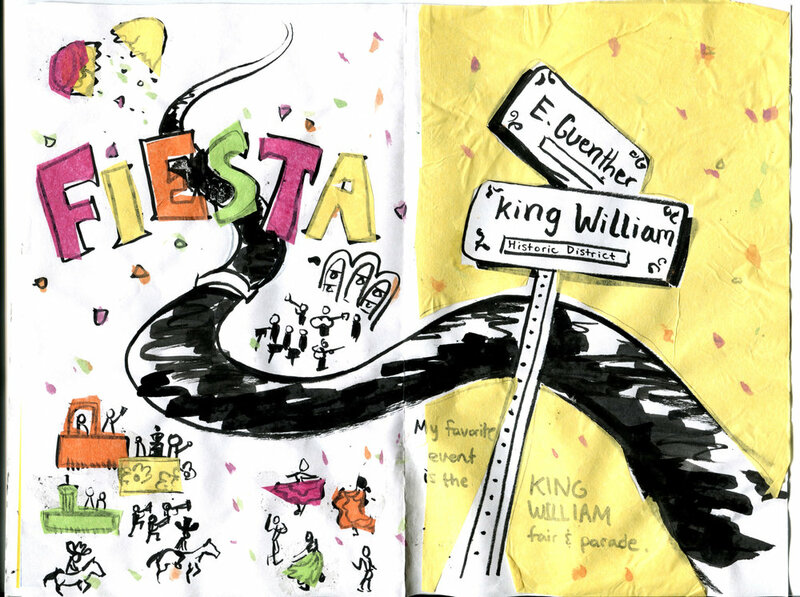 I also used visual motifs such as confetti and cascarones to tie the pages of the book together and to further illustrate the fun and excitement of the King William Fair. Unlike with most of my work, this project did not start out with a set of thumbnail sketches. Instead, I started drawing on a large sheet of newsprint with no clear image in my mind of what the final product would look like. The small scene depicting the King William's Fair parade sprawled outward chaotically like a Where's Waldo page; in doing so, I hoped to capture some sense of the flurry of colors, sounds, and smells at the festival. I also used loose, fast lines to quickly create impressions of people and objects to avoid spending too much time on one area. Once I had an idea of the mood I wanted to capture, the kinds of scenes I would draw, and the drawing style I wanted to use, I began to translate the collage drawing to the book format. I created thumbnail sketches for a few of the spreads to outline the content of the book. Once I had thumbnails for the spreads, I created rough drawings and made a dummy of the book. I mainly wanted to get an idea of how the book would open and what the pacing would be like. Thanks to the dummy, I realized that the "How to Make Cascarones" page felt out of place at the beginning of the book. I had originally wanted to introduce the idea of the cascarone early on to use it as a recurring theme, but that ended up being too confusing. I also wanted to experiment with the use of color. Originally I planned to use tissue paper to fill in the color. I thought that this might suggest confetti and convey the spirit of fiesta. However, the tissue paper proved difficult to work with and didn't scan well. Ultimately, I decided that coloring the drawings in Photoshop would be the best solution. Once I had a clear sense of what each page would look like, I moved onto the final drawings. Most of the final drawings started out as tight pencil sketches, which I then traced over with a brush pen. I then scanned the ink drawings and colored them digitally.